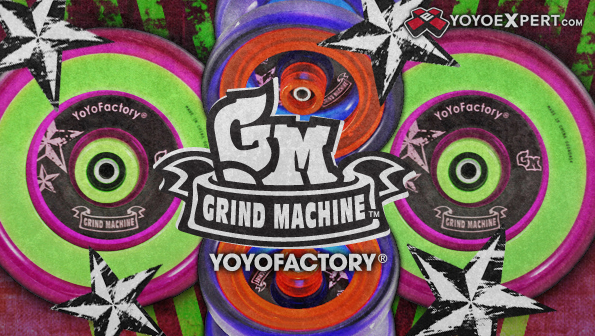 The all new Grind Machine yo-yo features a full polycarbonate body and is the first yo-yo to feature a fully functioning version of YoYoFactory's ever famous hub stacks. With hub stacks you can literally grab the yo-yo from the sides and hold it! Or better yet instead of throwing just pull start the Grind Machine. And of course with a name like Grind Machine - you have to expect this yo-yo to grind. The Grind Machine actually features a special textured rim to allow for less friction while on the surface of the skin or clothing. Intermediate players will love this yo-yo for its unresponsive play, hub stacks, and stable spin. Experts will love this yo-yo for its shape and smoothness. As one of the most affordable YoYoFactory yo-yos on the market its one that belongs in every collection. You will forget you aren't throwing an all metal yo-yo!